Nick Leverett will be the only HBCU student-athlete to receive the award this season. Durham, NC– Nick Leverett thought he was just attending a regularly scheduled football practice, but what he didn’t know is that during the team huddle, representatives from the athletics department and Allstate would be there to surprise him with his Allstate AFCA Good Works Team trophy and say a few words to recognize his dedication to the community off the field. 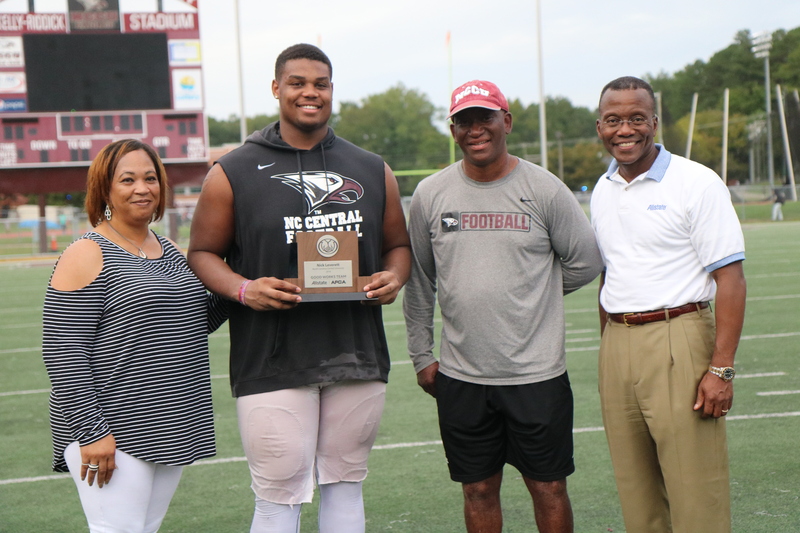 During his time at NCCU, the Concord, North Carolina native has collected donations and food to feed those in need for Thanksgiving, spoken to local area students about building character, participated in domestic violence awareness activities, and rounded up mentees to feed the homeless around Durham. On multiple occasions Leverett has volunteered at Habitat for Humanity, helping to build homes for those less fortunate. Leverett graduated with his bachelor’s in July of 2018 as a seven-time Dean’s List Honoree and is currently studying towards a Masters. Leverett is also a proud member of Omega Psi Phi! Leverett is one of only 22 college football players from across the country to be named to the 2018 Allstate AFCA Good Works Team®. For more than 25 years, the Allstate AFCA Good Works Team® has honored the college football players whose charitable involvement and community service contributions stand out among the more than 50,000 student-athletes participating in the sport. The student-athletes nominated for this prestigious honor have made a commitment to enriching the lives of others while contributing to the greater good of their communities. From the 169 nominees, 11 players from the Football Bowl Subdivision and 11 players from the Football Championship Subdivision, Divisions II, III and the NAIA were selected to comprise the 22-player team. The 2018 Allstate AFCA Good Works Team® members will be invited to New Orleans to participate in a community project before the 2019 Allstate® Sugar Bowl® in January. The Allstate AFCA Good Works Team® will also be honored during halftime at the 2019 Allstate® Sugar Bowl® on ESPN. Eagles let an early lead slip away against ACC team. Georgia State hires Tennessee assistant for head coaching job.